Well, here we are folks – observing yet another anniversary of that day 496 years ago when a tormented priest blew open the doors and windows of Rome with his ninety-five sentences that changed the course of history in ways that echo yet still – loud and clear. It was the thirty-first of October in 1517, in the University town of Wittenberg when and where Father Martin Luther, with fear and trembling, with excitement and joy, with an adrenaline bolus that must have made the good monk’s stomach churn and his blood run alternately hot and cold – it was All Hallows’ Even in 1517 when Father Martin Luther could no longer remain silent about the infinitely gracious God who in and through Jesus-Christ-upon-the-cross had finally and fully gotten into the head and heart of this tormented, broken, and utterly flawed human being. Today, we observe the anniversary of the day when this man who was a Roman Catholic priest until the day of his death cried out for the centuries to hear, what he himself at last had heard in St. Paul’s Letter to the Romans: namely, that no human being is righteous before God based on what she or he does, based on what he or she fails to do. Indeed, all human beings are tragically flawed and broken – all have sinned, all people – and without exception, and all people continually keep on falling short of the glorious gifts laid before us by God. And so to assure us of God’s peace, God came to earth as a human – not as an example but for this [pointing to crucifix]. One of the most well-know images – at least in the world outside of North America – one of the most well-known images of Fr. Martin Luther is of him in the pulpit in Wittenberg – one remarkably similar to this one – Fr. Martin standing in that pulpit and pointing to the crucifix next to the pulpit – a crucifix simple and similar to this one – and pointing to that crucifix, declaring for all to hear: Behold your God – this – the God who would rather sacrifice God’s very own self than lift a hand against you in anger, vengeance, pay-back, or power. And this, the God who was crucified, died, and was buried, on the third day rose again – came back, not with judgment against those who killed God-from-God, true-God-from-true-God; came back, not to visit red-hot revenge upon those who denied they had ever known God in Christ Jesus; came back, not to wreak recompense against those who in typical human cowardice had fled from his side; the Crucified and Risen God came back not to destroy the world – but to say to the world: Peace. Peace. My peace I give you – though you will never, ever understand the cosmic nature of my peace, my love, my desire to bring all of you to my very own side – a desire so strong that there’s nothing any of you can do to make me change my mind. Which brings me back to the beginning of this homily – today we observe the 496th Anniversary of the Holy Spirit knocking Martin Luther and the whole world upside the head. However, we can only observe – we cannot yetcelebrate. We cannot celebrate because our broken humanity has taken this Gospel, has taken this Infinitely Good News – and whether siding with the Pope and the Emperor; whether siding with Fr. 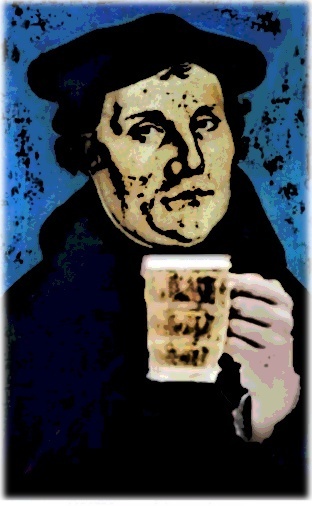 Luther (who only wanted to start a teaching order within the Roman Church – like Francis, or Dominic, or Benedict) or Erasmus; whether one had Lutheran sympathies or Papal sympathies – as in our heresy against the creation, we have taken what God intended for good – and we’ve screwed it all up. Yes, indeed we have screwed it up – and we keep on screwing it up – all of us whom God loves intimately regardless of human labels – we have all screwed up, and, as St. Paul says, we – all of us – continually keep on falling short of the glorious gifts of life God intends for all humanity. We’ve hurt one another badly in and throughout the whole Church – we keep on hurting one another badly, yes. But now in this 496th year since that dear, dreadful, drunken, misbehaving, passionate, foul-mouthed priest with his bathroom humor started a reformation of the entire church – now in this 496th year comes another person, just so happens a priest, a Jesuit (you know how they’ve always been accused of having Lutheran tendencies), there comes from Argentina, a man, just another human being as he sees it, comes one of us, Francis his chosen name, and he says – the Church must continue to reform: there can be no more pointing fingers – Lutherans at Roman Catholics, Roman Catholics at Lutherans; gays at straights and straights at gays; men at women and women at men; pro-choice at no-choice and so on . . . no morethe pointing of fingers at one another – rather now, the time to forgive one another in the Name of Christ Jesus – to forgive one another for the tremendous hurt we have inflicted upon each other these almost 500 years. Now, time to go forward, unafraid – forward to the day when there shall be – yes, there shall be – a full communion between the Roman and Lutheran Catholic traditions. And that communion, dearest Francis has said, that communion will and must be centered upon the one crucial thing that sets the Christian Church apart from all other organizations: the cross, and the one with God upon it (and not the empty one – the Roman Empire was littered with empty crosses that didn’t mean a damn thing), God upon it in mercy – God who here passes over all our sin – even our most heinous sin – that is, our daily virtual murder of the God of Love and Mercy, the God who in loving mercy gives us a peace that we’ll never understand, at least not until that self-same God comes again in Christ Jesus to greet us as we each at last go forth from this world. And on that day, with the battalions of heaven we shall indeed celebrate – but in the meantime – we observe – we remember with sadness all the hurtful things that we have done and keep on doing to one another – not just Roman Catholics and Lutherans – but all human beings, wherever we are found. But even as I have said, echoing both the Most Reverend Munib Yunan, presiding Bishop of the Lutheran World Federation and courageous, grace-filled Francis of Rome – we observe the Reformation – we do not celebrate. However, even as we retreat from patting ourselves on the back for being either Lutheran or Roman Catholic, we here, in this place may, indeed, do have some cause quietly to celebrate just a tad. Here ten years ago, thanks to yet another courageous Roman Catholic priest, some Roman Catholics and Some Lutheran Catholics came together and began to say that, in this place, the many judgmental things we do to one another in the Name of God, in the Name of Gentle, Crucified Jesus – all of those things we will endeavor, by the help of God, to set aside. Here the first word, the last word, and every word in between shall be of the God who would rather die than be known as anything than the God who showers infinite love upon all of utterly screwed-up humanity. And if and when anything gets in the way of the Good News of that same God – be it gender or gender identity, skin color or language, ethnicity or sexual orientation, age or political leanings, occupation or income, or anything else in all creation – if anything gets in the way of proclaiming the God who dies so that we shall know the full forgiveness of every wrong, past, present, and yet to come – if anything gets in the way of that Great, Good News – we must continue to reform our ways. No – not we must – rather, we will, and we do keep on reforming our ways, sometimes swiftly, other times slowly, by fits and by starts, through laughter and tears – not because we are strong or exceptional (sorry, we’re not, you know) – but solely because the Spirit of God promised to us and given to us isexceptional – because the Spirit of God – here on the corner of 16th and Grant – is at work in us and among us so that one-by-one – one-by-one and without exception and without condition – so that one-by-one, all the world come to hear and see and to know the God who forgives our iniquity and remembers our sin no more. Here, on this corner Roman Catholics and Lutheran Catholics live in full communion with one another in order that, one-by-one, all the world might one day come to hear and to know that the God who has turned death into life does and will bring all people home to the feast that knows no end, yes all people shall be seated at the Table of the Lord – as God has revealed once and for all in Gentle Jesus who says to each and every single one of you (and even to this grossly flawed and broken preacher): Peace. My own peace I give to you – and the day is coming when all creation will fully know the God of Mercy even as all creation is already fully known by the God of Mercy, is already fully overwhelmed by the inescapable God of Love. So yes, today we observe the reform of the Church begun by an obstreperous Roman Catholic priest – even as we do indeed celebrate the Holy Gospel, the Holy Good News which God in Christ Jesus reveals for all, here in this place in Word and Sacraments – the Good News which no one and nothing, no force in all creation, will ever be able to silence. And the craziest thing is – here, by the grace of God, we are actually beginning to believe it.